Food Costs > How Much Does a Pizza Vending Machine Cost? The pizza vending machine phenomenon was created by a company called Let’s Pizza!, which originated in Italy, but other brands have hit the market as well such as Pizza Touch and PALINE. These machines are commonly found at an existing pizzeria as an extension to the restaurant itself. Like a vending machine that dispenses chips or soda, a pizza vending machine works in a similar way but delivers a hot pizza instead. The cost of a pizza vending machine greatly depends on the brand you’re looking to purchase. From what we researched, the retail costs were in the $32,000 to $55,000 range. For example, Pizza Today claimed the PALINE branded pizza ATM vending machine cost $55,000, but it offered an exceptional one-year ROI. Selling an average of 20 to 30 pizzas per day, leading machines could make up to $90,000 a year selling 40+ pizzas per day. According to the Daily Mail, the Let’s Pizza vending machine retails for $32,000. The average pizza inside the vending machine will retail for $4 to $9, depending on the brand. 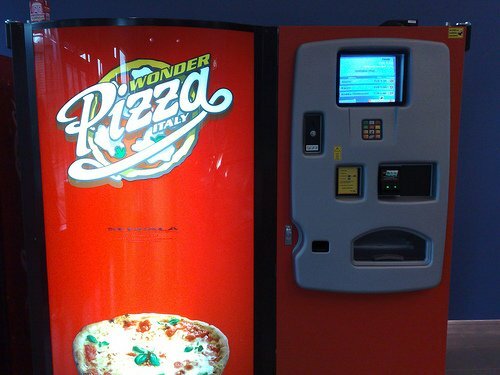 Using a pizza vending machine works in the same way a bank ATM does. Swiping a card first, a customer will then be able to choose the available pizzas using the touchscreen. Most of the machines don’t actually cook the pizza, however, but rather, the pre-cooked pizzas will be stored in a temperature-controlled refrigeration unit, cooked in the oven when the customer activates their choice. The average pizza can take two to five minutes to prepare and can run 24 hours per day, seven days a week. The Let’s Pizza machine, on the other hand, will prepare pizza with flour, tomato sauce and the desired toppings, cooking the pizza while a customer can watch through the see-through glass. The average pizza vending machine can hold 70 to 90 pizzas at once.